National Intelligence Director James Clapper has received the Defense Department‘s highest civilian award in recognition of his leadership role over Office of National Intelligence and larger intelligence community. 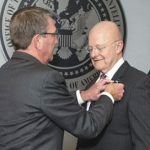 Defense Secretary Ashton Carter presented Clapper the Defense Distinguished Civilian Service Medal during a ceremony held at ODNI’s headquarters, DoD said Friday. “No one has better demonstrated that instinct to serve better than Jim Clapper,” said Carter. “He has said the reason our nation and its national security enterprise keeps evolving and keeps getting better is because of our people and their instinct to serve he says,” he added. Carter noted that the DoD and DNI continue to work together in an effort to integrate intelligence and provide customers with new products to support decision makers, as well as help to keep the security of the country.